I was honored to be the first Undergraduate student selected to have a piece displayed in the new main lobby gallery of the Lamar Dodd School of Art. It is one of the major pieces from my BFA Exhibition. I was honored to be highlighted in located in the Bertelsmann Gallery of Athens Academy. My work was shown along with several of my clay friends from the UGA Ceramics Studio, another local artist & painter, Maria Nissan, as well as several students in the Athens Academy Art Club. I had 15 pieces in the show from early March through the end of April. I am very grateful for Dr. Lawrence Stueck, accomplished sculptor and scholar, including me in this show! My Art Education degree was comprehensive in its studio focus and also included an Exit Exhibition at the close of our degree. While I was student teaching in Spring of 2015, I had the opportunity to exhibit work with my fellow student teaching classmates, who are also incredibly talented artists themselves. I was incredibly honored to have three pieces selected by my friend, fellow Lamar Dodd artist, and incredibly talented painter, Michael Ross (MFA Candidate - Painting). This was one of the most impactful experiences in my career, and definitely the most expansive body of work I have made thus far. I feel I found a new voice, way of making, and form of expression through the creation of these pieces. *Please see my "bfa Exit" page on this website for all photos and the full description of this body of work. My beloved Professor, Ted Saupe, and me at the Closing Reception of my BFA Exit Exhibition in December, 2015. I am eternally grateful for all that this man has taught me about art and life. *See full show on "bfa Exit" page of this website. I was excited to have 2 works selected for the Georgia Small Works 2014 Exhibition! I had so enjoyed being in this show the previous year, that I decided to apply again! The only run is that the work must be at or less than 14 inches in any direction, yet can be any medium. There were many great small works shown! I was incredibly excited and honored to be chosen for the annual Southworks 2014 show by OCAF! 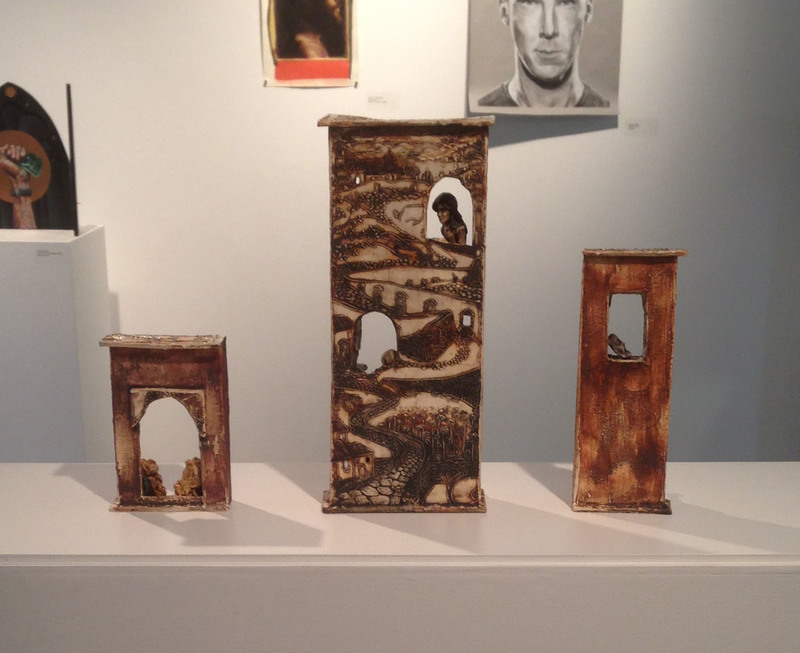 This juried show features works from among some the most talented southern artists. Artists apply from across the south to be represented in this show. It was a great honor and a show I will always cherish being a part of.